It is October! Yay! October is the best month of the year because it ends with Halloween, the best holiday of the year. And with Halloween quickly approaching, I thought it was a good time to share my favorite running app. It is scary, fun, exciting, and moving. Why is it perfect for Halloween? One word: zombies. That's right! It is Zombies, Run! "You are Runner 5. Hundreds of lives are counting on you. You've got to help your base rebuild from the ruins of civilization by collecting critical supplies while avoiding roving zombie hordes. Can you save them and learn the truth about the zombie apocalypse?" It is a little ridiculous how caught up in the story you can become. There are a whole slew of characters that you get introduced to over the course of each season, and you get the story one piece at a time, with each season being divided into different "missions". Every time you go for a run, you choose the next mission and get the next piece of the story through your headphones. The app will also mix in your own music, which is a nice bonus. I've even set up a playlist of songs specifically for use with Zombies, Run! It is, as you can probably guess, zombie themed. When I say that you get caught up in the story, I'm not joking. You can get really attached to the different characters you encounter. There was one specific mission where I became very emotional due to what was happening, and I ended up crying like a baby while I ran. It is surprisingly difficult to run while you are crying your heart out, but it is possible. There are days when I don't feel like running, but I'll head out anyway because I want to know what happens next in Zombies, Run! In addition to the awesome story, the app also keeps track of your time, distance, and pace for you. If you like stats, then everything is easy to find. Did you really like the route you ran last time but can't remember exactly what it was? Zombies, Run! also keeps track off your routes, and you can pull up the maps for your different runs by logging in to the website. Want to run indoors? It also works on the treadmill, because you can track your distance in a number of different ways, or just turn the tracker off and input your distance yourself after your run is finished. As you run, you collect supplies, which you can then use to build up your base within the app. Within the settings of the app, you can choose to set your runs to last about 30 minutes or about an hour. Once you have finished a mission, you'll hear "Mission Completed" through your headphones. If you want to keep running, then don't worry. It doesn't stop tracking you until you hit the stop button, and the app will automatically go into "Radio Mode" after you complete a mission. In Radio Mode, your music will continue playing, with occasional interruptions from Jack and Eugene, the two characters who run Radio Abel, which is pretty much what it sounds like - your friendly neighborhood zombie apocalypse radio show. I'm not going to lie. I kind of love Radio Mode. It may be my favorite part of the app, and I will sometimes set my runs for 30 minutes even if I plan to run for longer, because I want plenty of time to listen to the Radio Mode. Want an even better workout? There is an optional "Zombie Chase", which acts as a kind of interval training. If you choose to turn on Zombie Chase mode, then you will randomly be told during your run that zombies have been detected. You have to speed up to evade the zombies. As they get closer, you will hear them moaning behind you. You will get warnings that the zombies are gaining on you (zombies are 100 meters away, 50 meters away, etc.) if you aren't going fast enough. If the zombies get too close, then you will start to drop supplies that you have collected. If the zombies catch you too many times, then you fail the mission and will have to start over. When I say you have to speed up to escape the zombies in Zombie Chase mode, I mean you have to sprint. Zombie Chase doesn't mess around. 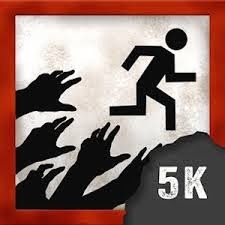 There is also a second app within the world of Zombies, Run! They have a 5k training program, which is what I used when I first started running. It is perfect for beginners. It is similar to a lot of 5k training programs in that it combines walking and running, with each week increasing the amount of running while decreasing the amount of walking. Although the characters are the same, the story is a little different, as the training program is training you to become a runner, while in the regular app you are already a runner. "You’re Runner 5, a vital member of one of the last outposts of humanity at Abel Township. Over the course of an eight week, 25 workout training programme, you’re trained to help collect supplies and protect the town from the encroaching zombie apocalypse." When I first started the 5k app, I couldn't even run for 5 minutes without stopping. By the time the 8 weeks were over, I was able to run for 30 minutes without stopping. After I finished the 5k program, I bought and started the regular app. One of the things I really liked about the 5k app is that it isn't all running. 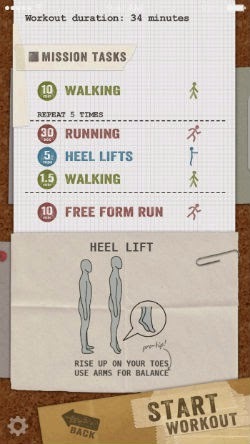 Yes, you hear the instructions to walk or run (no need to time yourself, the app will tell you to start running when your 5 minutes of walking is done), but you also end up doing heel lifts, squats, stretching, and all sorts of other things that can help you become stronger and faster. Yes, it is a little weird stopping to do squats while you are running outside, but you get over it and do the exercise because you know that it is good for you in the long run. Neither of the programs are free, but they are both very affordable (under $5), and I've found them both to be more than worth the expense. So...there you have it. Zombies, Run! is pretty much delightful and has made my runs much more interesting. It is one of my favorite things. All views and opinions expressed within this post are my own. I want to make it clear that I'm not being paid for this post, nor was I asked to write this post. 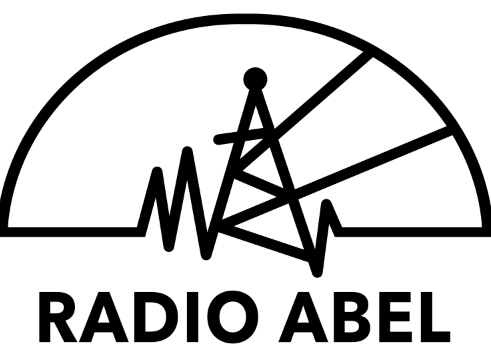 I just really love this app and think that it is awesome and wanted to share it.